Welcome Valley Village is a great location for small corporate retreats and business meetings. Our Village offers a stark contrast to most formal environments. Many former guests testify that they were able to get good quality work done here at our Village away from the daily distractions of their office. Host your banquet at our open-air Riverside Pavilion. 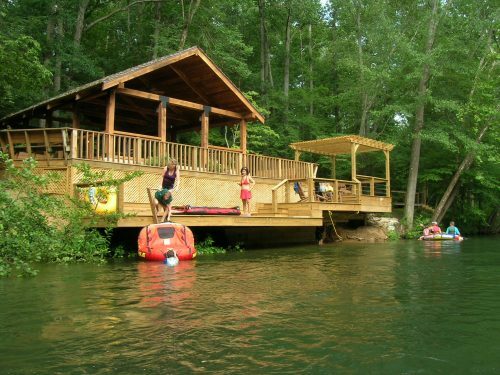 Many guests rent one or more cabins and incorporate overnight stays in their program. A group of up to 20 persons is a comfortable size for all five cabins, and ensures everyone their own bed. Also, special discounts apply when all five cabins are rented. Daily assemblies are generally held in our Riverside Pavilion (weather permitting) or inside either the Pines or the Ocoee House cabins. Often, guests rent one cabin for a day meeting. Most groups choose to rent either the Pines or the Ocoee House cabin for day meetings because the living rooms are large and can accommodate groups of up to about 16 people comfortably. Also, during the winter time, it’s nice to work in the presence of a warm crackling fire in these cabins’ fireplaces. Our Riverside Pavilion is a wonderful open-air location for meetings, cookouts, or catered meals during temperate months. Overhead ceiling fans and cool breezes from the river can make even the warmest days comfortable. 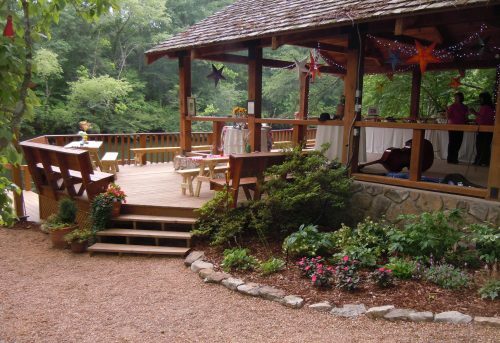 Because the Ocoee House cabin is only about 100 feet away, we do not rent the Pavilion by itself. Rather if you rent the Ocoee House cabin, we reserve the Pavilion for the exclusive use of your group, for a fee based on group size. Our cabins do not have telephones, however most cell phone services receive a signal here. We can also provide fax services. The cabins and Riverside Pavilion have wi-fi. We will be happy to help you arrange recreational activities or food services for your group. 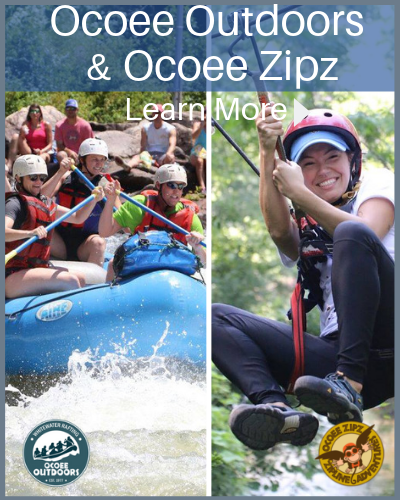 Welcome Valley Village is located on 17 wooded acres along the beautiful Ocoee River. Our five log cabin rentals are spaced sufficiently apart from one another to allow privacy for each. Our property features a striking variety of trees, wildflowers and native plants. 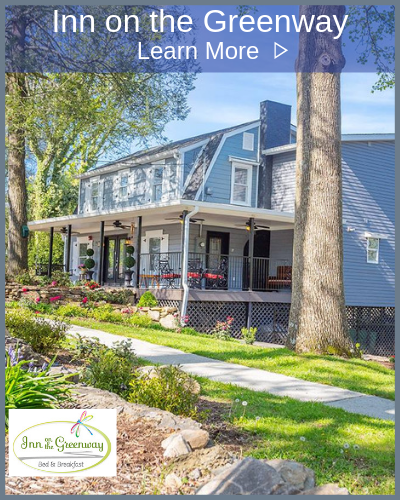 Mother Nature’s work is beautifully complemented with landscaped areas around the cabins and elsewhere featuring displays of brilliantly-colored annuals and perennial shrubs and flowers. The most popular gathering spot in the Village is our Riverside Pavilion. It blends perfectly with the natural beauty of the area with its cedar-shingle roof and wraparound deck extending along the edge of the river. 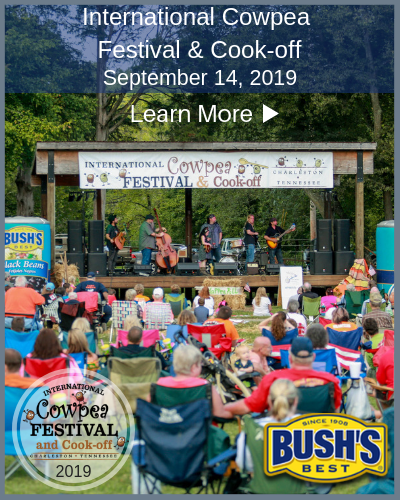 The Pavilion offers a perfect gathering place for large families, company meetings/functions, weddings, or anyone looking for a serene open-air environment in which to assemble. The Pavilion features ceiling fans, lights, large charcoal grill, six picnic tables with benches and electrical outlets. An adjacent log bathhouse provides mens and women’s restrooms. Our 17 acre Village is only 2 miles off Highway 64 and 3 miles from the town of Benton, but you’ll feel like you’re tucked away in a remote forest. There is a grocery store in Benton and several neighborhood restaurants to choose from. Some of them will cater.